You’ve asked and we’ve answered! 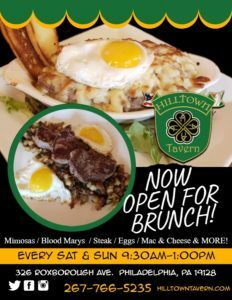 Hilltown Tavern will open at 9:30 am every Saturday and Sunday for brunch, starting this week! 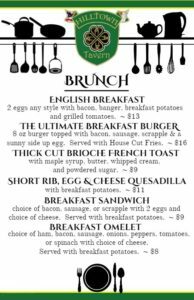 Whether you are coming from church, just getting your day started, or looking for a little “hair of the dog” there is something for everyone on our all new Brunch Menu! EAGLES GAMEDAY IN THE U.K. ! Join us bright and early as your Philadelphia Eagles take on the Jacksonville Jaguars in London! We’ll have $4 Mimosas, $4 Bloody Marys, and a brand new Brunch Menu! Don’t forget to grab a 22oz Hilltown Super Champ Mug with Bud Light for $5 and just $3 refills during any Eagles Game! EARLY OPEN AT 8:30 AM!